The newest storm in the western Pacific Ocean will track through the Philippine Sea this weekend, potentially developing into a typhoon before impacting land next week. Trami developed into a tropical storm just northwest of Guam late on Friday night eastern Asia time, when sustained wind speeds reached 64 km/h (40 mph). Guam experienced wind gusts as high as 55 km/h (35 mph) earlier on Friday when this system passed over the island as a depression. An area of high pressure stationed east of Japan will push Trami slowly westward through the weekend. It is then expected to slow down as it approaches the northern Philippines and Taiwan. With at least 2,400 km (1,500 miles) of the Philippine Sea between this tropical system and its next landfall, communities have several days to prepare for possible impacts from Trami. “As the storm approaches the continent, we will have a better idea of where it will go,” said AccuWeather Meteorologist Rob Richards. This storm could impact the northern Philippines, which has recently suffered widespread damage from typhoons, flooding and mudslides. However, it is more likely that the storm will turn northward. 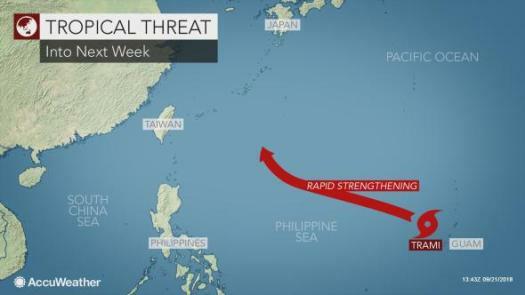 “Residents and anyone with interests across Japan, Taiwan and eastern China need to keep an eye on this storm,” Richards said. Light wind shear and warm ocean waters ahead of Trami indicate it will have plenty of opportunity for strengthening as it slowly tracks westward. Trami could reach typhoon strength as soon as Sunday. By the middle of next week, the weather across the northern Philippines, Taiwan and the Okinawa region of Japan could be influenced by this storm.